Mutations in the Cu/Zn-superoxide dismutase (SOD-1) gene are responsible for a subset of familial cases of amyotrophic lateral sclerosis. Using a primary culture model, we have demonstrated that normally nontoxic glutamatergic input, particularly via calcium-permeable AMPA/kainate receptors, is a major factor in the vulnerability of motor neurons to the toxicity of SOD-1 mutants. Wild-type and mutant (G41R, G93A, or N139K) human SOD-1 were expressed in motor neurons of dissociated cultures of murine spinal cord by intranuclear microinjection of plasmid expression vector. Both a general antagonist of AMPA/kainate receptors (CNQX) and a specific antagonist of calcium-permeable AMPA receptors (joro spider toxin) reduced formation of SOD-1 proteinaceous aggregates and prevented death of motor neurons expressing SOD-1 mutants. Partial protection was obtained by treatment with nifedipine, implicating Ca2+ entry through voltage-gated calcium channels as well as glutamate receptors in potentiating the toxicity of mutant SOD-1 in motor neurons. Dramatic neuroprotection was obtained by coexpressing the calcium-binding protein calbindin-D28k but not by increasing intracellular glutathione levels or treatment with the free radical spin trap agent, N-tert-butyl-α-phenylnitrone. Thus, generalized oxidative stress could have contributed in only a minor way to death of motor neurons expressing the mutant SOD-1. These studies demonstrated that the toxicity of these mutants is calcium-dependent and provide direct evidence that calcium entry during neurotransmission, coupled with deficiency of cytosolic calcium-binding proteins, is a major factor in the preferential vulnerability of motor neurons to disease. Amyotrophic lateral sclerosis (ALS) is an adult-onset disease involving loss of motor neurons in the cerebral cortex, brainstem, and spinal cord. Approximately 10% of ALS cases are familial (FALS), and a subset of these are a result of dominantly inherited mutations in the gene encoding the enzyme Cu/Zn-superoxide dismutase (SOD-1) (Rosen et al., 1993). Over 60 different mutations have been identified that are associated with clinical disease that is phenotypically indistinguishable from sporadic ALS (Pramatarova et al., 1994, 1995; De Belleroche et al., 1996; Shaw et al., 1998). We have created a culture model by expressing humanSOD-1 with mutations found in FALS patients in primary motor neurons in dissociated cultures of murine spinal cord (Durham et al., 1997). Expression of individual mutant enzymes is induced by intranuclear microinjection of plasmid expression vector and resulted in cell death over a period of 2 weeks. As in humans and transgenic mice, motor neurons in culture were preferentially vulnerable to mSOD-1 toxicity (i.e., compared with dorsal root ganglion neurons and hippocampal neurons). In studies described here, we used our culture model to investigate mechanisms by which glutamatergic input might contribute to the vulnerability of motor neurons to mSOD-1 toxicity. Several studies have supported the importance of excitotoxic mechanisms in motor neuron diseases. Motor neurons have a high level of glutamatergic input and are extremely vulnerable to excitotoxic cell death (Regan and Choi, 1991; Stewart et al., 1991; Rothstein and Kuncl, 1995). Elevated levels of excitatory amino acids have been measured in serum and cerebrospinal fluid in ALS patients (Plaitakis, 1991); glutamate transport is decreased in brain and spinal cord in ALS (Rothstein et al., 1992), and loss of the glial glutamate transporter GLT-1 has been implicated in human patients with sporadic ALS (Rothstein et al., 1995; Aoki et al., 1998) and in transgenic mice expressing G85R mutant SOD-1 (mSOD-1) (Bruijn et al., 1997b). Together, these studies implicate increased glutamate receptor activation, in some cases as a consequence of impaired glutamate uptake, in motor neuron death. Glutamate receptor activation can result in increased intracellular calcium ions and in generation of reactive oxygen species (Choi, 1994;Dugan and Choi, 1994). That motor neurons are deficient in both cytosolic calcium-binding proteins and the important antioxidant, reduced glutathione, could increase their susceptibility to damage by either mechanism (Ince et al., 1993; Alexianu et al., 1994; Beiswanger et al., 1995; Elliott and Snider, 1995; Reiner et al., 1995; Junttila et al., 1995). We examined the involvement of Ca2+influx in mSOD-1 toxicity both by treating cultures with antagonists of calcium-permeable glutamate receptor subtypes or L-type voltage-gated calcium channels and by coexpressing the cytosolic calcium-binding protein, calbindin-D28k. The contribution of generalized free radical generation was tested by increasing intracellular glutathione (GSH) levels using glutathione ethyl ester or by treatment with the free radical binding agent N-tert-butyl-α-phenylnitrone (PBN). Our results implicate Ca2+ entry during glutamatergic neurotransmission as a major mechanism contributing to the toxicity of SOD-1 mutants in motor neurons. Primary cultures of dissociated spinal cord (along with dorsal root ganglia) were prepared from embryonic day 13 (E13) CD1 mouse embryos. After dissociation in trypsin, cells were plated at a density of 200,000 per well in four-well Nunclon culture dishes containing round glass 13 mm coverslips (Fisher Scientific, Montreal, Quebec, Canada) coated with poly-d-lysine (Sigma, St. Louis, MO) plus Matrigel basement membrane matrix (Collaborative Research, Bedford, MA). The culture medium was minimum essential medium enriched with 5 gm/l glucose (EMEM) and supplemented with 2% horse serum, 10 μg/ml bovine serum albumin, 26 ηg/ml selenium, 20 μg/ml triiodothyronine, 10 μg/ml insulin, 200 μg/ml transferrin, 32 μg/ml putrescine, 9.1 ng/ml hydrocortisone, 13 ng/ml progesterone, and 10 ng/ml nerve growth factor. Triiodothyronine was purchased from Calbiochem (San Diego, CA); all other growth factors and hormones were purchased from Sigma. On days 4–6, cultures were treated with 1.4 μg/ml cytosine-β-d-arabinoside (Calbiochem) to minimize growth of non-neuronal cells. The cultures were maintained at 37°C in 5% CO2. Cultures were used in experiments 4–7 weeks after dissociation. At this age in vitro, motor neurons can be distinguished from other types of neurons and glia in the cultures because they have developed to resemble their counterparts in intact spinal cord, both morphologically and by expression of biological markers. They have much larger cell bodies (>20 μm in diameter) relative to other spinal neurons and large, tapering, highly branched dendrites with a fibrillar appearance (Fig. 1A). The fibrillar appearance is caused by the high content of neurofilaments that are labeled by antibodies to neurofilament proteins such as SMI32 (Fig. 1C). That these neurons are motor neurons has been validated in studies showing that they express properties of motor neurons in situ; i.e., by intracellular recording of trains of action potentials (Ransom et al., 1977; Kohn et al., 1995) and by immunocytochemical demonstration of choline acetyltransferase (Carriedo et al., 1996), calcitonin gene-related peptide (Carriedo et al., 1996), glutamate receptors (H. Durham and S. Minotti, unpublished results), and an extensive network of neurofilaments extending into dendrites (Durham, 1992). The sensitivity of these neurons to glutamate excitotoxicity has been shown in several studies (Regan and Choi, 1991; Stewart et al., 1991; Regan, 1996;Carriedo et al., 1996; this study). Also, separate culture of ventral and dorsal spinal cord has demonstrated that the large SMI32-positive neurons originate from the ventral cord, further supporting their motoneuronal identity (Carriedo et al., 1996). Phase-contrast micrographs of a motor neuron (A) and DRG sensory neurons (B) in living spinal cord–DRG cultures.C, Lower magnification view of spinal cord–DRG culture 4 weeks in vitro labeled with antibody SMI32 against neurofilament proteins. Arrowhead points to cell identified as a motor neuron (see Materials and Methods). Also visible are small spinal neurons and larger DRG neurons. Scale bars, 20 μm.D–F, Distribution of wild-type human SOD-1 (D) and G93A mutant SOD-1 (E, F) in motor neurons after intranuclear microinjection of plasmid expression vector (200 μg/ml). Three days after microinjection, cells were immunolabeled with antibody specific to human SOD-1 (Sigma) followed by anti-mouse IgG-Texas red. Two general patterns of mSOD-1 distribution are observed: diffuse distribution of mSOD-1 throughout the motor neuron similar to that observed with wild-type human SOD-1 (E) and localization in punctate aggregates (F). Scale bar, 20 μm. 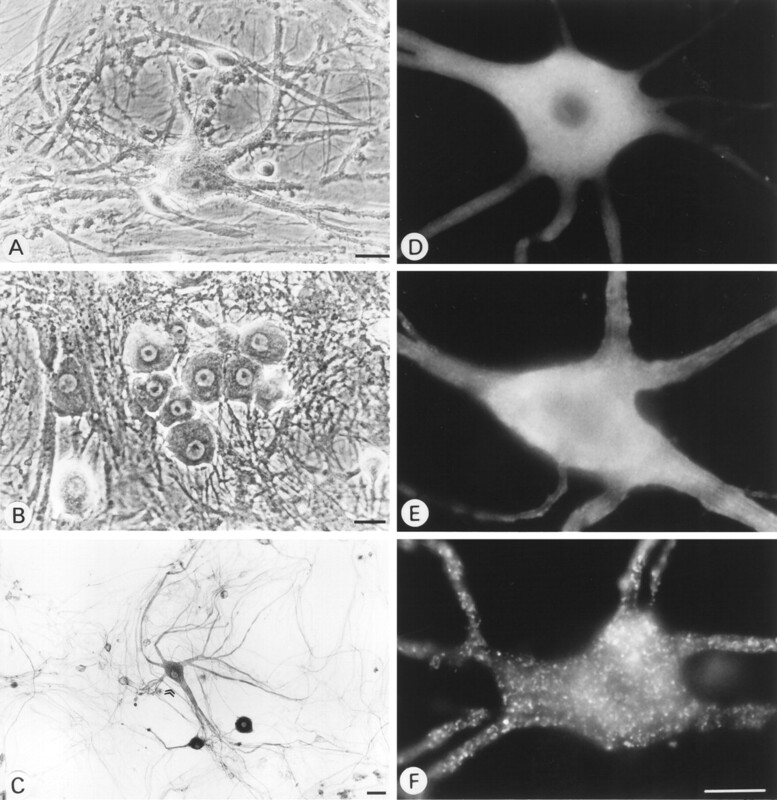 Motor neurons are readily distinguishable from large sensory DRG neurons in culture that also retain the morphology characteristic of these neurons in spinal ganglia; they have large, rounded cell bodies and axonal processes, but lack dendrites (Fig.1B,C). FALS-associated point mutations [Gly41→Arg (G41R), Gly93→Ala (G93A), Asn139→Lys (N139K)] were introduced by site-specific mutagenesis in the wild-type human SOD-1 cDNA (wtSOD-1), and cDNAs were cloned into the expression vector pCEP4 under control of the CMV promoter (pwtSOD-1, pG93A, pG41R, pN139K) (Durham et al., 1997). Calbindin-D28k was cloned from 4 week-old mouse cerebellar RNA. Total RNA was isolated using Tri-Reagent (Molecular Research Center). Reverse transcription was performed using SuperScript II RNase H-Reverse Transcriptase. PCR was performed using 10 pm of both sense and antisense primers, 5 U of Taq DNA polymerase with proofreading activity (Sigma); and otherwise standard conditions for 35 cycles: 94°C for 30 sec; 55°C for 30 sec; and 72°C for 3 min. (Primer sequences: CAGGGGTACCTCCGCGCACTCTCAAACT and GCGGGGATCCAGTACAATTGAGTTTAATC.) After purification of the PCR product, the calbindin-D28k cDNA and pCEP4 expression vector (Invitrogen, San Diego, CA) were both double digested with BamHI andKpnI (Life Technologies, Gaithersburg, MD). After ligation, 5 μl of the ligation mix was used to transform Top 10 competent cells. Colonies were screened using standard minipreps. Several inserts were purified and completely sequenced at the University of Rochester automated sequencing facility. To verify expression of the calbindin-D28k protein, PC12 cells were transfected and subsequently selected by addition of hygromycin to the media (200 μg/ml). We observed strong immunostaining for calbindin-D28k in stably transfected cells (data not shown) and in motor neurons microinjected with expression vector (see Fig.5A). Persistent expression in motor neurons over 2 weeks without cytotoxicity was obtained with microinjection of 30 μg/ml pcalbindin-D28k. Expression vectors (in tris-EDTA) were microinjected into the nuclei of motor neurons; 70 kDa dextran-FITC (Molecular Probes, Eugene, OR; 15 mg/ml) was included in the injectate as a marker of injected cells (Durham et al., 1997). The concentration of each expression vector resulting in expression of detectable protein by immunolabeling in >90% of injected cells was determined in preliminary studies. All SOD-1 constructs (mutant and wild-type) were injected at 200 μg/ml (Durham et al., 1997). Viability was assessed microscopically each day by counting the number of motor neurons containing the marker. The number of neurons was normalized to the number present on day 1 after microinjection to exclude any neurons dying from the injection procedure (Durham et al., 1997). Of ∼40–70 injected, 15–40 motor neurons per coverslip survived the injection (Durham et al., 1997). At the end of the experiment, expression of transgenic protein in remaining neurons was verified by immunolabeling. Formation of cytoplasmic aggregates reactive with antibody to human SOD-1 is consistently observed in motor neurons expressing several different mutants, but not wild-type SOD-1 (Durham et al., 1997). To determine the percentage of motor neurons in which mutant SOD-1 was incorporated into aggregates, cultures were fixed on the specified day after microinjection and labeled with mouse monoclonal antibody specific for human SOD-1 (see below). Labeled motor neurons were counted under visualization by epifluorescence microscopy, and the distribution was categorized as diffuse or aggregated (i.e., the majority of immunoreactive protein in the cell body was in aggregates). Data were analyzed by Student’s t test, with statistical significance established at p < 0.05 (unpaired, two-tailed). Cultures were fixed for 10 min in 3% paraformaldehyde in PBS, pH 7.2, and permeabilized in 0.5% Nonidet-P40 for 1 min, followed by an additional 2 min in paraformaldehyde and blocking in 3% skim milk. Transgenic human SOD-1 protein was visualized by immunolabeling with mouse antibody specific to human SOD-1 (S2147, clone SD-G6; Sigma). Sheep polyclonal anti-SOD1 from the Binding Site (Birmingham, UK) was used when cultures were double-labeled with monoclonal antibody to calbindin-D28k (Sigma, clone CL-300). Secondary antibodies (anti-sheep IgG-FITC, anti-mouse IgG-Texas Red) were from Jackson ImmunoResearch (West Grove, PA). To label with SMI32 antibody to neurofilament proteins (Sternberger Monoclonals, Baltimore MD; diluted 1:2000), cultures were fixed in methanol for 4 min, then acetone for 2 min, both at −20°C. Antibody labeling was visualized using the ABC kit (Vector Laboratories, Burlingame, CA) with diaminobenzidine as substrate. Various blocking agents were added to the culture medium ∼5 hr after microinjection and maintained throughout the experiment, with replenishment every 3 d, unless otherwise indicated. Glutamate receptor blockers. Kynurenic acid (nonspecific ionotropic glutamate receptor blocker; Sigma);d-2-amino-5-phosphonovaleric acid (APV; NMDA receptor blocker; Sigma); 6-cyano-7-nitroquinoxaline-2,3-dione disodium (CNQX; AMPA/kainate receptor blocker; Research Biochemicals, Natick, MA); and synthetic joro spider toxin (JSTX-3; blocker of inward rectifying, Ca2+-permeable AMPA receptors that lack the GluR2 subunit; Research Biochemicals) were used as glutamate receptor blockers. L-type voltage-gated calcium channel blocker. Nifedipine (Sigma) was diluted 1:2000 in culture medium from a stock in dimethylsulfoxide (DMSO) to give a final concentration of 1 μm. Higher concentrations were toxic to the cultures after 3 d exposure. Control cultures were treated with an equivalent concentration of DMSO (0.05%). Free radical scavengers. Glutathione ethyl ester (Sigma) and PBN (Sigma) were used as free radical scavengers. Effective concentrations of blocking agents were obtained from the literature; the ability of specific agents to prevent toxicity of glutamate receptor agonists or superoxide, generated by the redox cycling compound paraquat, were tested as follows. Motor neurons were microinjected with the dextran-FITC marker. The following day, marked cells were counted and antagonist was added to the culture medium. Five hours later, 50 μm glutamic acid (Sigma), 5 μm AMPA (ICN Biochemicals, Montréal, Québec, Canada), or 25 μm paraquat (Sigma) was added to the culture medium. Surviving dextran-FITC-injected motor neurons were counted after an additional 24 or 48 hr. To evaluate the protective effect of calbindin-D28k, agonists were added to the culture medium 24 hr after microinjection of expression vector plus dextran-FITC into motor neuronal nuclei. GSH levels were estimated using the fluorescent probe, Cell Tracker Green (chloromethylfluorescein diacetate, Molecular Probes), a membrane-permeant, thiol-reactive compound that reacts with GSH to form a membrane-impermeant GSH-fluorescent dye adduct. Although such probes may also react with protein thiols, 95% of the adducts should be with GSH (Molecular Probes). Cultures were loaded with a 5 μmconcentration of this procompound for 15 min in the incubator. The medium was exchanged, and the cultures were incubated for an additional 30 min. Cultures were then washed twice with PBS and fixed in 3% paraformaldehyde in PBS for 15 min. Cell Tracker Green was visualized by epifluorescence microscopy using filters for fluorescein. As in previous studies with our model system (Durham et al., 1997), expression of human SOD-1 with the G93A mutation was lethal to cultured motor neurons compared with expression of wtSOD-1 (Fig.2A). Viability of motor neurons microinjected with pwtSOD-1 expression vector was not significantly different from those injected with “empty” pCEP4 (Fig. 2B). To determine whether activation of particular subtypes of ionotropic glutamate receptor subtypes contributes to the toxicity of mutant SOD-1 in motor neurons, cultures were treated with the following blocking agents beginning 5 hr after microinjection of wtSOD-1 or G93A expression vector: kynurenic acid (antagonist of both NMDA and non-NMDA ionotropic glutamate receptors), CNQX (AMPA/kainate receptor antagonist), or APV (NMDA receptor antagonist). Treatment of cultures with the broad spectrum antagonist kynurenic acid completely prevented the loss of viability caused by G93A expression over the 12 d observation period. Similar neuroprotection was observed by treatment with CNQX, but not APV (Fig.2A). Thus, the neuroprotection exerted by kynurenic acid on G93A-induced death of motor neurons must have been mediated predominantly through blockade of AMPA/kainate receptors. Similar results were obtained in motor neurons expressing two other SOD-1 mutants, N139K or G41R (Fig. 2C,D). A, Motor neuron death induced by mSOD-1 expression was prevented by blockade of non-NMDA ionotropic glutamate receptors but not NMDA receptors. Motor neurons were microinjected with pwtSOD-1 or pG93A (200 μg/ml) plus the fluorescent marker, 70 kDa dextran-FITC. Survival of injected neurons was evaluated at days 1, 3, 6, 9, and 12 after injection by counting cells containing the marker. Experiments were conducted in the presence and absence of kynurenic acid (antagonist of both NMDA and non-NMDA ionotropic receptors; 1 mm), CNQX (non-NMDA ionotropic receptor blocker; 5 μm), or APV (NMDA receptor antagonist; 100 μm). For additional details, see Materials and Methods. B, Blockers of ionotropic glutamate receptors were neither generally neuroprotective nor toxic to motor neurons in culture. Motor neurons were microinjected with pCEP4 vector or pwtSOD-1 alone plus dextran-FITC. The usual attrition of cells normally observed in cultures of this age was not affected by kynurenic acid (1 mm) or by a combination of CNQX and APV. C, D, CNQX also protected motor neurons from death induced by different human SOD-1 mutants (200 μg/ml) pN139K (C) or pG41R (D). Shown are means ± SD of results from four to seven different cultures; *significant reduction of cell death; Student’s t test (unpaired, two-tailed; p < 0.05). In the absence of mSOD-1 expression, the level of activation of glutamate receptors on motor neurons did not affect viability. Receptor antagonists had no effect on the normal attrition of neurons from the culture over the period of observation [i.e., viability of motor neurons injected with pCEP4 (empty vector) or with pwtSOD-1was neither increased nor decreased by treatment with kynurenic acid or by a combination of CNQX and APV (Fig.2B)]. In previous studies (Durham et al., 1997), an abnormal distribution of mSOD-1 proteins in punctate or globular cytoplasmic aggregates was observed in motor neurons expressing SOD-1 with the G93A mutation as well as several other mutations (G37R, G41R, G93C, I113T, and N139K). At various times during the first week after microinjection of G93A expression vector, immunocytochemistry with antibody specific to human SOD-1 revealed that the mutant SOD-1 was present in small punctate aggregates in one-quarter to one-half of the mSOD1-expressing motor neurons remaining at each time of observation (Fig.1F). This was in contrast to the diffuse distribution (Fig. 1E) that always was observed with wild-type transgenic human SOD-1 (Fig. 1D). Formation of mSOD-1 aggregates was linked to apoptotic cell death because all neurons with aggregates were TUNEL-positive by day 5 after microinjection, and TUNEL labeling/chromatin condensation were only observed in motor neurons with aggregates (Durham et al., 1997). Similar aggregation of G93A SOD-1 was observed in the present study. By 3 d after microinjection of expression vector, G93A SOD-1 was aggregated in 28% of expressing motor neurons, and at 5 d this percentage was increased to 46% (Table 1). Because blockade of AMPA/kainate receptors had dramatically reduced loss of viability induced by SOD-1 mutants, we tested the effectiveness of various ionotropic glutamate receptors in preventing formation of aggregates, a prelethal endpoint of toxicity. All three ionotropic glutamate receptor blockers (kynurenic acid, APV, and CNQX) significantly reduced the percentage of motor neurons containing cytoplasmic anti-SOD-1-immunoreactive aggregates at 3 d after microinjection (Table 1). 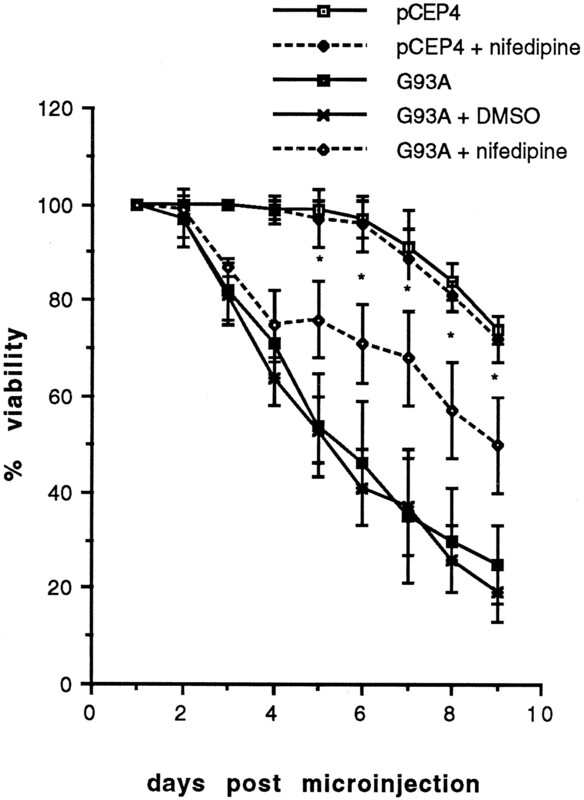 These results indicated that activation of either non-NMDA or NMDA ionotropic glutamate receptor activation could promote mSOD-1 aggregation; however, protection by APV was short-lived compared with CNQX; i.e., on day 5 after microinjection, the treatment with APV made no difference to the percentage of G93A-expressing motor neurons with aggregates (Table 1). Thus, AMPA/kainate receptor blockade dramatically reduced two endpoints of G93A toxicity in motor neurons, formation of mSOD-1 aggregates, and cell death. That the delay of aggregate formation by APV was so transient is consistent with the inability of this compound to protect against motor neuron death. Because many classes of neurons that receive glutamatergic input are resistant to the toxicity of mSOD-1, the preferential vulnerability of motor neurons may result from a differential expression of specific glutamate receptor subtypes (Tölle et al., 1993; Jakowec et al., 1995; Carriedo et al., 1996; Regan, 1996; Tomiyama et al., 1996;Williams et al., 1997). AMPA/low-affinity kainate receptors mediate fast neurotransmission to motor neurons and are formed by homo-oligomeric or hetero-oligomeric assembly of subunits termed GluR1–4 (for review, see Tölle et al., 1993; Hollmann and Heinemann, 1994; Seeburg, 1996). The conductance properties of AMPA receptor channels vary with the subunit composition of the receptor; those channels that lack the Q/R-edited GluR2 subunit are permeable to Ca2+ and exhibit an inwardly rectifying current–voltage relationship (for review, see Hollmann and Heinemann, 1994; Seeburg, 1996). Although murine motor neurons do express GluR2 (Morrison et al., 1998), there is physiological evidence that a population of Ca2+-permeable AMPA/kainate receptors is present on motor neurons (Carriedo et al., 1996; Regan, 1996). We used JSTX-3, which selectively blocks inwardly rectifying and Ca2+-permeable AMPA receptors in a use- and voltage-dependent manner (Blaschke et al., 1993; Iino et al., 1996), to determine whether excitation of Ca2+-permeable AMPA receptors potentiated the toxicity of mSOD-1. 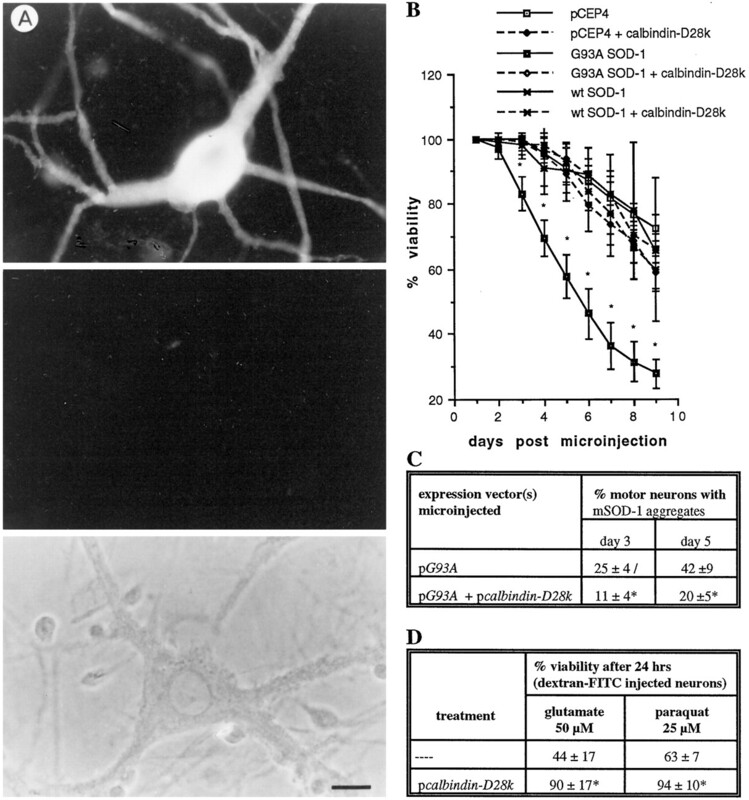 JSTX-3 [0.5 μm, the IC90(Blaschke et al., 1993)] preserved viability of motor neurons expressing G93A mSOD-1 (Fig.3B) and reduced formation of aggregates (Fig. 3C), indicating that activation of such receptors was largely responsible for potentiating G93A mSOD-1 toxicity in these cells. JSTX-3 also prevented motor neuron death induced by the agonist, AMPA (5 μm), although not quite as effectively as 5 μm CNQX (Fig. 3A). Under the experimental conditions, AMPA toxicity was caused by selective activation of AMPA receptors; experiments were performed in the presence of APV, to exclude NMDA receptor activation, and the concentration of AMPA used does not induce current flow through kainate receptors, which also can carry calcium current (Egebjerg et al., 1991; Sommer et al., 1992). JSTX-3, an inhibitor of Ca2+-permeable AMPA receptors, prevented motor neuron death induced by both AMPA and the G93A SOD-1 mutant.A, The day after microinjection of motor neurons with 15 mg/ml dextran-FITC, marked neurons were counted, and the various glutamate receptor blockers were added to the culture medium (0.1 mm APV ± 5 μm CNQX or 0.5 μm JSTX-3). Five hours later, cultures were challenged with 5 μm AMPA. Viability was assessed by counting surviving marked neurons after an additional 24 hr. B, pG93A (200 μg/ml) was injected into motor neuronal nuclei along with dextran-FITC, and viability was assessed daily. We added 0.5 μm JSTX-3 to the culture medium 5 hr after microinjection and replenished it every 3 d.C, JSTX-3 reduced formation of aggregates in motor neurons expressing G93A SOD-1. On day 3, cultures were immunolabeled with antibody specific to human SOD-1, and the percentage of cells in which most of the immunoreactive mutant SOD-1 was localized in punctate aggregates was determined. Shown are means ± SD for results obtained from three or four cultures per treatment group; *significant difference in the absence and presence of JSTX-3, unpaired, two-tailed Student’s t test; p < 0.05. In addition to entry of Ca2+ through glutamate receptor channels, calcium also can enter through voltage-gated calcium channels (VGCC), particularly L-type channels that are activated after depolarization of the postsynaptic membrane, but have minimal effects on neurotransmitter release in motor neurons (for review, seeKrieger et al., 1994; Ghosh and Greenberg, 1995). Treatment of cultures with nifedipine (1 μm), an antagonist of L-type VGCC, delayed the death of motor neurons expressing mutant SOD-1 (Fig.4), although this antagonist was not as effective as AMPA receptor blockade. Blockade of voltage-gated calcium channels by nifedipine (1 μm) delayed loss of viability of motor neurons expressing mutant SOD-1. pG93A (200 μg/ml) was injected into motor neuronal nuclei along with dextran-FITC, and viability was assessed daily. Shown are means ± SD for results obtained from four cultures per treatment group; *significant difference between G93A SOD-1 alone and G93A SOD-1 plus nifedipine, unpaired, two-tailed Student’st test; p < 0.05. The vulnerability of motor neurons resulting from Ca2+ influx may be compounded by their low native levels of calcium-binding proteins (CaBP) such as calbindin, parvalbumin, calretinin, and neurocalcin (Ince et al., 1993; Alexianu et al., 1994; Elliott and Snider, 1995; Junttila et al., 1995; Reiner et al., 1995). If this is the case, increasing expression of a cytosolic CaBP should be protective. Neither motor neurons injected with pCEP4 (Fig. 5A,middle and bottom panels) nor uninjected motor neurons (data not shown) were labeled by antibody to calbindin, confirming that expression of this CaBP is as low in our model as it is in motor neurons of intact spinal cord. Strong immunolabeling by anti-calbindin was observed after microinjection of 30 μg/ml expression vector encoding calbindin-D28k (Fig. 5A,top panel). Coexpression of pcalbindin-D28k with the G93A expression vector was markedly protective; viability of motor neurons was indistinguishable from controls (Fig. 5B), and the formation of SOD-1 aggregates was substantially reduced (Fig. 5C). Calbindin-D28k protected motor neurons from the toxicity of G93A SOD-1. A, Top panel, Increased level of calbindin-D28k was demonstrated 3 d after microinjection of pcalbindin-D28k (30 μg/ml) by immunolabeling with antibody specific to calbindin-D28k. Middle panel, Motor neuron injected with control vector pCEP4 was not labeled (phase micrograph of this neuron is presented in bottom panel). Scale bar, 20 μm. B,C, Motor neuronal nuclei were injected with pG93A or pwtSOD-1 ± pcalbindin-D28k along with dextran-FITC.B, Coexpression of calbindin-D28k dramatically preserved the viability of motor neurons expressing mutant SOD-1.C, Coexpression of calbindin-D28k reduced the percentage of motor neurons with aggregated SOD-1 on day 3 after microinjection by 56%. D, Calbindin-D28k protected motor neurons from death induced by both glutamate and paraquat. See Materials and Methods for details. Shown are means ± SD for results obtained from three to six cultures per treatment group; *significant difference in the absence and presence of pcalbindin-D28k, unpaired, two-tailed Student’s t test; p < 0.05. Calbindin protected motor neurons from exogenous glutamate, as previously reported for hippocampal neurons (Mattson et al., 1991), and from the redox cycling compound paraquat, indicating that calbindin can protect neurons from a variety of toxic insults by improving the ability of the cell to regulate intracellular calcium (Fig.5D). That calbindin rescued motor neurons from massive oxidative stress induced by paraquat affirms the central role played by calcium in motor neuron death. Most cells maintain strongly reducing conditions by the action of radical scavenging molecules such as GSH and associated enzymes. GSH is a tripeptide (glycine–cysteine–glutamic acid) that serves as a general free radical scavenger in cells as well as being required for the detoxification of hydrogen peroxide by glutathione peroxidase. Using a vital probe for intracellular free thiols (Cell Tracker Green), it was demonstrated that motor neurons in culture do not contain significant reserves of reduced GSH, relative to glial cells (Fig.6A,B); this is similar to what is observed in spinal cord in situ(Beiswanger et al., 1995). Glutathione ethyl ester is a cell membrane-permeant analog of GSH that has been used to increase intracellular free radical scavenging ability of cells and to protect neurons from methylmercury toxicity (Sarafian et al., 1994; Kruman et al., 1997). Exposure to 1 mm glutathione ethyl ester resulted in an obvious increase in Cell Tracker Green fluorescence in motor neurons (Fig. 6C) and protected motor neurons from death induced by superoxide, generated by the redox cycling compound paraquat (Fig. 7A). Partial protection against glutamate toxicity was also observed, consistent with a combination of free radical and calcium-mediated mechanisms of cell death with this excitotoxicant (Fig. 7A). However, inclusion of 1 mm glutathione ethyl ester in the culture medium had no significant effect on the viability of motor neurons expressing G93A mSOD-1 (Fig. 7B) or on formation of mSOD-1 aggregates (Fig. 7C). Cell Tracker Green fluorescence remained high throughout the experiment indicating that reduced thiols were not depleted. The membrane-permeant agent PBN forms stable adducts with transient free radicals, and 50 μm has been shown to attenuate glutamate toxicity in other neuronal culture models (Cheng and Sun, 1994; Mattson et al., 1995); however, this concentration of PBN was ineffective in preventing motor neuron death induced by G93A mSOD-1 (Fig. 7D). Increase in GSH levels in cultured motor neurons by treatment with glutathione ethyl ester. GSH was visualized using the fluorescent probe, Cell Tracker Green. A, Untreated cultures. Note minimal fluorescence (i.e., reduced GSH) in the two motor neurons indicated by arrows and inB by phase contrast. C, Culture treated with 1 mm glutathione ethyl ester in the medium for 3 d showing marked increase in Cell Tracker Green fluorescence relative to control. Scale bar, 20 μm. Glutathione ethyl ester failed to protect motor neurons from toxicity of G93A SOD-1. A, 1 mmglutathione ethyl ester (GSH EE) completely protected motor neurons from death induced by paraquat and provided partial protection against glutamate-induced death. See Materials and Methods for details.B, pCEP4 or pG93A (200 μg/ml) was injected into motor neuronal nuclei along with dextran-FITC (15 mg/ml). 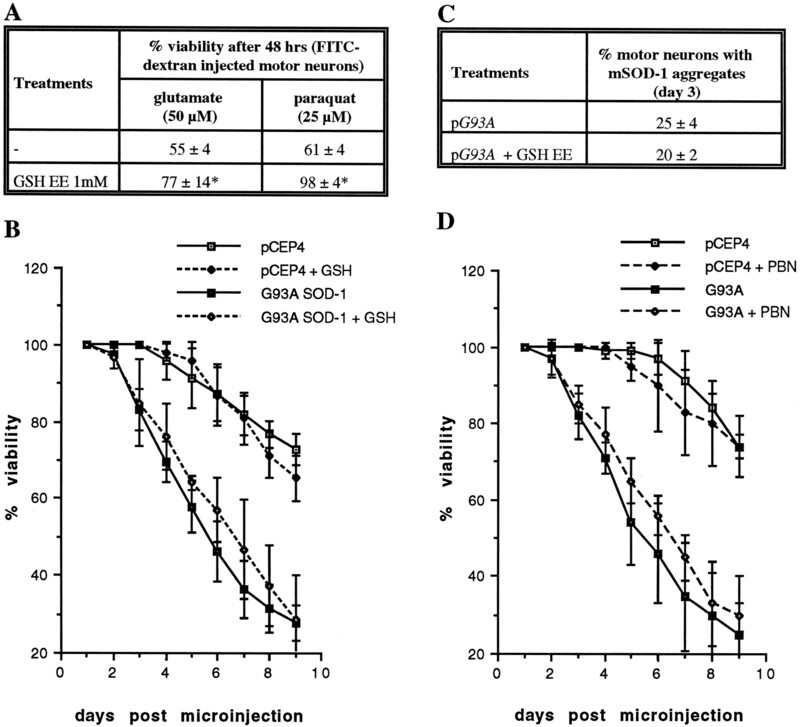 Addition of 1 mm GSH EE, beginning 5 hr after microinjection, failed to preserve the viability of motor neurons expressing G93A SOD-1 or (C) to alter the percentage of motor neurons in which most of the immunoreactive mutant SOD-1 was localized in punctate aggregates. D, The free radical spin trap agent, 50 μm PBN failed to protect motor neurons from death induced by expression of G93A mSOD-1. Shown are means ± SD for results obtained from four cultures per treatment group; *significant difference in the presence or absence of GSH EE, unpaired, two-tailed Student’s t test;p < 0.05. This study provides strong evidence that influx of calcium ions, particularly through Ca2+-permeable AMPA/kainate receptors and to a lesser extent voltage-gated calcium channels, is a key mediator in the ability of glutamatergic neurotransmission to potentiate the toxicity of SOD-1 mutants. JSTX-3, a specific inhibitor of Ca2+-permeable AMPA receptors, (Blaschke et al., 1993; Iino et al., 1996), was almost as effective as CNQX, a general AMPA/kainate receptor antagonist, in preventing motor neuron death induced by G93A mSOD-1 and precipitation of the mutant protein into aggregates. Because JSTX-3 does not block calcium-permeable kainate receptors, our experiments do not exclude their contribution to mSOD-1 toxicity; however, the almost complete rescue of motor neurons from cell death after treatment with JSTX-3 suggests that AMPA receptor activation was the major contributor. Moreover, the results with JSTX-3 confirm that cultured motor neurons express Ca2+-permeable AMPA/low-affinity kainate receptors, implying that a population of these receptors lack GluR2, the subunit that confers Ca2+-impermeability to these channels (for review, see Hollmann and Heinemann, 1994; Seeburg, 1996). Previous studies demonstrated Ca2+ influx after stimulation of cultured motor neurons by kainate (Carriedo et al., 1996; Regan, 1996). The degree of GluR2 expression in motor neurons has been controversial (Tölle et al., 1993; Jakowec et al., 1995; Tomiyama et al., 1996;Temkin et al., 1997; Williams et al., 1997); however, in a recent study using a monoclonal antibody to GluR2, protein was detected in murine spinal motor neurons and observed at synaptic densities (Morrison et al., 1998). Our studies in spinal cord cultures using this antibody are consistent with this finding; GluR2 was detected at a population of motor neuron dendritic synapses, but with a more restricted distribution compared with GluR4 (Durham and Minotti, unpublished data). Increased intracellular Ca2+ might also result from activation of NMDA receptors or VGCC or by release from intracellular stores. A minor role for NMDA receptor activation in mSOD-1 toxicity is indicated by the transient reduction in formation of mSOD-1 aggregates, but this was too short-lived to preserve viability significantly. In contrast, nifedipine significantly delayed death of motor neurons expressing G93A mSOD-1, implicating influx of Ca2+through VGCC. By what mechanisms could calcium potentiate the toxicity of mutant SOD-1 in motor neurons? One possibility is that handling of calcium is compromised as a consequence of sublethal mSOD-1 toxicity, and motor neurons are not able to cope with additional Ca2+load resulting from neurotransmission, precipitating cell death. This will be tested in future studies by imaging of calcium fluxes and concentrations in intracellular compartments. Mitochondria are important regulators of intracellular free Ca2+concentration, and there is evidence of mitochondrial damage in some lines of transgenic mice and SH-SY5Y cells expressing G93A mSOD-1 (Gurney et al., 1994; Carri et al., 1997; Kong and Xu, 1998). Release of calcium from mitochondrial stores was measured in G93A-expressing SH-SY5Y cells, but whether this occurs early or is a late, nonspecific event remains to be determined. The consequences of increased intracellular Ca2+ may be compounded by the low levels of CaBP such as calbindin, parvalbumin, calretinin, and neurocalcin in motor neurons (Ince et al., 1993;Alexianu et al., 1994; Elliott and Snider, 1995; Junttila et al., 1995;Reiner et al., 1995). Because motoneuronal pools that are preserved in patients with ALS (oculomotor and abducens nuclei) do express significant levels of one or more CaBP, it has been proposed that sparing of these motor neurons is related to their expression of these Ca2+-chelating proteins (Ince et al., 1993; Alexianu et al., 1994; Elliott and Snider, 1995; Reiner et al., 1995). If so, increasing CaBP levels in vulnerable motor neurons, either by gene therapy or pharmacological treatment (Alexianu et al., 1998), should be protective. Our finding that increasing expression of calbindin dramatically protected cultured motor neurons from G93A mSOD-1 toxicity supports this hypothesis. Calbindin could protect motor neurons by chelating Ca2+ entering the cell during neurotransmission or calcium that has been released from intracellular stores or leaked through the plasma membrane secondary to free radical damage. Other studies have suggested that production of damaging free radicals may be responsible for the toxicity of mSOD-1. In cell free systems, a number of mutants exhibited altered metal-binding properties (Carri et al., 1994; Lyons et al., 1996; Crow et al., 1997; Hart et al., 1998); enhanced peroxidative activity relative to wild-type enzyme was reported in two studies (Wiedau-Pazos et al., 1996; Yim et al., 1996), but not in a third (Singh et al., 1998). In addition, vitamin E slightly delayed onset of symptoms in G93A SOD-1 transgenic mice (Gurney et al., 1996); free radical scavengers reduced the toxicity of V148G mSOD-1 in PC12 cells (Ghadge et al., 1997); fibroblasts from FALS patients are more sensitive to free radical-generating agents in culture (Aguirre et al., 1998); some oxidative DNA damage and increased nitrotyrosine were detected in spinal cord of FALS patients (Abe et al., 1997) and free, but not protein, nitrotyrosine was increased in G37R transgenic mice (Bruijn et al., 1997a). However, generation of hydroxyl radicals was not evident in tissue from G85R SOD-1 transgenic mice (Bruijn et al., 1997a), and no significant increase in protein carbonyls was detected in FALS patients (Bowling et al., 1993; Shaw et al., 1995; Ferrante et al., 1997). Another source of motor neuron vulnerability that needed to be considered was the low level of reduced GSH available in these cells to scavenge free radicals and reactive intermediates. Depletion of GSH promotes oxidative stress, and increasing GSH levels protects neuronal cell lines or primary neurons from oxidant-induced injury (Ratan et al., 1994; Kruman et al., 1997). However, neither increasing intracellular GSH levels nor treatment with the free radical spin trap agent PBN ameliorated the effect of G93A mSOD-1 on motor neurons, as assessed by either loss of viability or formation of cytoplasmic aggregates. These two cell membrane-permeant scavengers demonstrated effectiveness in protecting motor neurons from toxicants known to induce free radical-mediated injury, indicating that generalized production of free radicals was not primarily responsible for mSOD1-mediated motor neuron death. In contrast to our results in primary motor neurons, free radical scavengers were more protective than calbindin in PC12 cells transduced with adenoviral recombinants encoding V148G mSOD-1 (Ghadge et al., 1997). This discrepancy could reflect differences in the mechanism of toxicity of different mutants or could reflect important differences in pathways leading to cell death in clonal cell lines versus primary motor neurons. The key properties of mutant SOD-1 molecules that initiate toxicity remain uncertain. Whether catalysis of free radical generation at the active site is important is controversial (vide supra), but could not be assessed in living motor neurons because neither glutathione ethyl ester (GSHEE) nor PBN would penetrate into the active site channel of the enzyme as do small, membrane-impermeant molecules such as DMPO (Wiedau-Pazos et al., 1996; Yim et al., 1996, 1997). It is possible that local generation of reactive species could have consequences other than generalized free radical damage throughout the cell, such as post-translational modifications to the mutant SOD-1 protein itself or other molecules in the vicinity. In other studies, we demonstrated that upregulation of stress proteins with chaperoning activity protects cells from toxicity of SOD-1 mutants (Bruening et al., 1998). These proteins are important for refolding modified proteins and targeting them for degradation in proteosomes. Excitation of neurons by glutamate also stresses chaperoning systems (Rordorf et al., 1991). The various stresses to which a particular cell type is subjected relative to the ability of protective mechanisms to counteract harmful effects will influence the homeostatic mechanisms that are disturbed and the relative vulnerability of the cell to expression of toxic protein. That many pathways are sensitive to Ca2+ reinforces the importance of mechanisms to regulate its distribution among intracellular compartments. In ALS, the therapeutic use of drugs that reduce presynaptic release of glutamate (riluzole, gabapentin) is based on observations of increased extracellular glutamate and decreased glial transporter function in spinal cord of ALS patients. In this study, the mutant proteins were expressed only in motor neurons, not in astrocytes; therefore, it is unlikely that decreased glial glutamate uptake and increased excitation of receptors contributed to motor neuron death (although secondary effects on glial cells by mSOD-1-expressing motor neurons cannot be ruled out entirely). Thus, in this model, postsynaptic mechanisms mediated potentiation of mSOD-1 toxicity in motor neurons downstream of glutamate receptor activation. If these postsynaptic mechanisms are operant with physiological levels of glutamatergic input to motor neurons in vivo, therapies that target neurotransmitter release may be of limited benefit because levels required to significantly protect motor neurons would also impair neurotransmission and motor function. In summary, this study directly demonstrates that excitation of glutamate receptors on motor neurons, particularly Ca2+-permeable AMPA/kainate receptors, potentiates the toxicity of SOD-1 mutants by postsynaptic mechanisms. That increasing the expression of a cytosolic CaBP protein, calbindin, was highly protective supports the theory that the normally low levels of such proteins in motor neurons is a highly significant factor in their vulnerability to destruction in FALS. These results suggest important new therapeutic strategies for ALS and demonstrate the central role that dysregulation of calcium homeostasis plays in the death of motor neurons. This research is supported by the Muscular Dystrophy Association (MDA) of Canada, Amyotrophic Lateral Sclerosis-Canada, MDA-USA (H.D.D. ), MDA-USA and NIHRO1 (D.A.F. ), and Fonds pour la Formation de Chercheurs et l’Aide à la Recherche (J.R.). H.D. is a Killam Scholar. We thank Dr. R. Gross for helpful comments and reading this manuscript. Correspondence should be addressed to Dr. Heather D. Durham, Montreal Neurological Institute, 3801 University Street, Montreal, Quebec, Canada H3A 2B4. (1997) Upregulation of protein-tyrosine nitration in the anterior horn cells of amyotrophic lateral sclerosis. Neurol Res 19:124–128. (1998) Increased sensitivity of fibroblasts from amyotrophic lateral sclerosis patients to oxidative stress. Ann Neurol 43:452–457. (1994) The role of calcium-binding proteins in selective motoneuron vulnerability in amyotrophic lateral sclerosis. Ann Neurol 36:846–858. (1998) 1α,25-dihydroxyvitamine D3-dependent up-regulation of calcium-binding proteins in motoneuron cells. J Neurosci Res 51:58–66. (1998) Mutations in the glutamate transporter EAAT2 gene do not cause abnormal EAAT2 transcripts in amyotrophic lateral sclerosis. Ann Neurol 43:645–653. (1995) Developmental changes in the cellular distribution of glutathione and glutathione S-transferases in the murine nervous system. Neurotoxicology 16:425–440. (1993) A single amino acid determines the subunit-specific spider toxin block of α-amino-3-hydroxy-5-methylisoxazole-4-propionate/kainate receptor channels. Proc Natl Acad Sci USA 90:6528–6532. (1993) Superoxide dismutase activity, oxidative damage, and mitochondrial energy metabolism in familial and sporadic amyotrophic lateral sclerosis. J Neurochem 61:2322–2325. Bruening W, Roy J, Giasson BI, Figlewicz DA, Durham HD (1999) Upregulation of protein chaperones preserves viability of cells expressing toxic Cu/Zn-superoxide dismutase mutants associated with amyotrophic lateral sclerosis. J Neurochem, in press. (1997a) Elevated free nitrotyrosine levels, but not protein-bound nitrotyrosine or hydroxyl radicals, throughout amyotrophic lateral sclerosis (ALS)-like disease implicate tyrosine nitration as an aberrant in vivo property of one familial ALS-linked superoxide dismutase 1 mutant. Proc Natl Acad Sci USA 94:7606–7611. (1997b) ALS-linked SOD1 mutant G85R mediates damage to astrocytes and promotes rapidly progressive disease with SOD1-containing inclusions. Neuron 18:327–338. (1994) Impaired copper binding by the H46R mutant of human Cu,Zn superoxide dismutase, involved in amyotrophic lateral sclerosis. FEBS Lett 356:314–316. (1997) Expression of a Cu,Zn superoxide dismutase typical of familial amyotrophic lateral sclerosis induces mitochondrial alteration and increase of cytosolic Ca2+ concentration in transfected neuroblastoma SH-SY5Y cells. FEBS Lett 414:365–368. (1996) Motor neurons are selectively vulnerable to AMPA/kainate receptor-mediated injury in vitro. J Neurosci 16:4069–4079. (1994) Oxidative mechanisms involved in kainate-induced cytotoxicity in cortical neurons. Neurochem Res 19:1557–1564. (1997) Decreased zinc affinity of amyotrophic lateral sclerosis-associated superoxide dismutase mutants leads to enhanced catalysis of tyrosine nitration by peroxynitrite. J Neurochem 69:1936–1944. (1996) Amyotrophic lateral sclerosis: recent advances in understanding disease mechanisms. J Neuropathol Exp Neurol 55:747–757. (1994) Excitotoxicity, free radicals, and cell membrane changes. Ann Neurol [Suppl] 35:S17–S21. (1992) An antibody against hyperphosphorylated neurofilament proteins collapses the neurofilament network in motor neurons but not in dorsal root ganglion cells. J Neuropathol Exp Neurol 51:287–297. (1997) Aggregation of mutant Cu/Zn superoxide dismutase proteins in a culture model of ALS. J Neuropathol Exp Neurol 56:523–530. (1991) Cloning of a cDNA for a glutamate receptor subunit activated by kainate but not AMPA. Nature 351:745–748. (1995) Parvalbumin is a marker of ALS-resistant motor neurons. NeuroReport 6:449–452. (1997) Evidence of increased oxidative damage in both sporadic and familial amyotrophic lateral sclerosis. J Neurochem 69:2064–2074. (1997) Mutant superoxide dismutase-1-linked familial amyotrophic lateral sclerosis: molecular mechanisms of neuronal death and protection. J Neurosci 17:8756–8766. (1995) Calcium signaling in neurons: molecular mechanisms and cellular consequences. Science 268:239–247. (1994) Motor neuron degeneration in mice that express a human Cu, Zn superoxide dismutase mutation. Science 264:1772–1775. (1996) Benefit of vitamin E, riluzole, and gabapentin in a transgenic model of familial amyotrophic lateral sclerosis. Ann Neurol 39:147–157. (1998) Subunit asymmetry in the three-dimensional structure of a human CuZnSOD mutant found in familial amyotrophic lateral sclerosis. Protein Sci 7:545–555. (1996) Voltage-dependent blockage of Ca2+-permeable AMPA receptors by joro spider toxin in cultured rat hippocampal neurones. J Physiol (Lond) 496.2:431–437. (1993) Parvalbumin and calbindin D-28k in the human motor system and in motor neuron disease. Neuropathol Appl Neurobiol 19:291–299. (1995) In situ hybridization analysis of AMPA receptor subunit gene expression in the developing rat spinal cord. Neuroscience 67:909–920. (1995) Localization of neurocalcin-like immunoreactivity in rat cranial motoneurons and spinal cord interneurons. Neurosci Lett 183:100–103. (1995) Assessment of the neurotoxicity of styrene, styrene oxide, and styrene glycol in primary cultures of motor and sensory neurons. Toxicol Lett 75:29–37. (1998) Massive mitochondrial degeneration in motor neurons triggers the onset of amyotrophic lateral sclerosis in mice expressing a mutant SOD1. J Neurosci 18:3241–3250. (1994) The role of intracellular free calcium in motor neuron disease. J Neurol Sci [Suppl] 124:27–32. (1997) Evidence that 4-hydroxynonenal mediates oxidative stress-induced neuronal apoptosis. J Neurosci 17:5089–5100. (1996) Mutations in copper-zinc superoxide dismutase that cause amyotrophic lateral sclerosis alter the zinc binding site and the redox behavior of the protein. Proc Natl Acad Sci USA 93:12240–12244. (1991) Evidence for calcium-reducing and excito-protective roles for the calcium-binding protein calbindin-D28k in cultured hippocampal neurons. Neuron 6:41–51. (1995) Neurotrophic factors attenuate glutamate-induced accumulation of peroxides, elevation of intracellular Ca2+ concentration, and neurotoxicity and increase antioxidant enzyme activities in hippocampal neurons. J Neurochem 65:1740–1751. (1998) Light and electron microscopic distribution of the AMPA receptor subunit, GluR2, in the spinal cord of control and G85R mutant superoxide dismutase transgenic mice. J Comp Neurol 395:523–534. (1991) Altered glutamatergic mechanisms and selective motor neuron degeneration in amyotrophic lateral sclerosis: possible role of glycine. Adv Neurol 56:319–326. (1994) A two base pair deletion in the SOD 1 gene causes familial amyotrophic lateral sclerosis. Hum Mol Genet 3:2061–2062. (1995) Identification of new mutations in the Cu/Zn superoxide dismutase gene of patients with familial amyotrophic lateral sclerosis. Am J Hum Genet 56:592–596. (1977) Mouse spinal cord in cell culture. I. Morphology and intrinsic neuronal electrophysiologic properties. J Neurophysiol 40:1132–1150. (1994) Oxidative stress induces apoptosis in embryonic cortical neurons. J Neurochem 62:376–379. (1996) The vulnerability of spinal cord neurons to excitotoxic injury: comparison with cortical neurons. Neurosci Lett 213:9–12. (1991) Glutamate neurotoxicity in spinal cord cell culture. Neuroscience 43:585–591. (1995) Brainstem motoneuron pools that are selectively resistant in amyotrophic lateral sclerosis are preferentially enriched in parvalbumin: evidence from monkey brainstem for a calcium-mediated mechanism in sporadic ALS. Exp Neurol 131:239–250. (1991) Heat shock protects cultured neurons from glutamate toxicity. Neuron 7:1043–1051. (1995) Neuroprotective strategies in a model of chronic glutamate-mediated motor neuron toxicity. J Neurochem 65:643–651. (1992) Decreased glutamate transport by the brain and spinal cord in amyotrophic lateral sclerosis. N Engl J Med 326:1464–1468. (1995) Selective loss of glial glutamate transporter GLT-1 in amyotrophic lateral sclerosis. Ann Neurol 38:73–84. (1994) bcl-2 expression decreases methyl mercury-induced free- radical generation and cell killing in a neural cell line. Toxicol Lett 74:149–155. (1996) The role of RNA editing in controlling glutamate receptor channel properties. J Neurochem 66:1–5. (1998) Mutations in all five exons of SOD-1 may cause ALS. Ann Neurol 43:390–394. (1995) Oxidative damage to protein in sporadic motor neuron disease spinal cord. Ann Neurol 38:691–695. (1998) Reexamination of the mechanism of hydroxyl radical adducts formed from the reaction between familial amyotrophic lateral sclerosis-associated Cu,Zn superoxide dismutase mutants. Proc Natl Acad Sci USA 95:6675–6680. (1992) A glutamate receptor channel with high affinity for domoate and kainate. EMBO J 11:1651–1656. (1991) Excitotoxicity in the embryonic chick spinal cord. Ann Neurol 30:758–766. (1997) Expression of glutamate receptor subunits in α-motoneurons. Mol Brain Res 52:38–45. (1996) Differential regional distribution of AMPA receptor subunit messenger RNAs in the human spinal cord as visualized by in situ hybridization. Neuroscience 75:901–915. (1993) The differential expression of 16 NMDA and non-NMDA receptor subunits in the rat spinal cord and in periaqueductal gray. J Neurosci 13:5009–5028. (1996) Altered reactivity of superoxide dismutase in amyotrophic lateral sclerosis. Science 271:515–518. (1997) Calcium-permeable α-amino-3-hydroxy-5-methyl-4-isoxazole propionic acid receptors: a molecular determinant of selective vulnerability in amyotrophic lateral sclerosis. Ann Neurol 42:200–207. (1997) A familial amyotrophic lateral sclerosis-associated A4V Cu,Zn-Superoxide dismutase mutant has a lower Km for hydrogen peroxide. J Biol Chem 272:8861–8863. (1996) A gain-of-function of an amyotrophic lateral sclerosis-associated Cu,Zn-superoxide dismutase mutant: an enhancement of free radical formation due to a decrease in Km for hydrogen peroxide. Proc Natl Acad Sci USA 93:5709–5714.